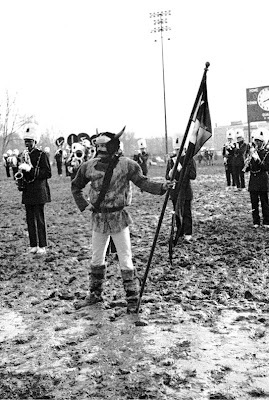 Tom Foote, the official Flint Northern Viking, at halftime of the 1967 Thanksgiving Day game. To help us celebrate Thanksgiving, Randy Gearhart passed along some great shots of the 1967 Thanksgiving Day game at Atwood Stadium between the Northern Vikings and the Central Indians. 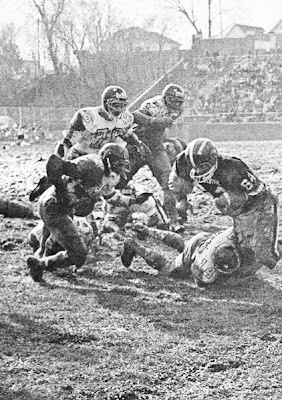 For obvious reasons, it came to be known as The Mud Bowl. Two minutes after a completing a fourth-quarter, 43-yard pass play that put the Vikings in scoring position, All-State co-captain William Wallace heads toward the end-zone to seal the 6-2 victory. 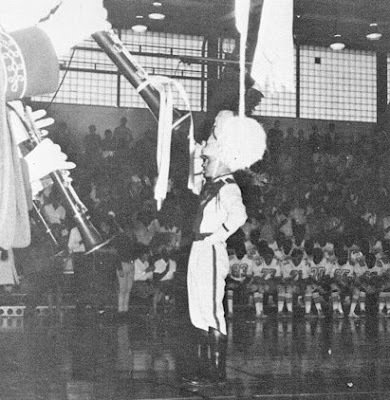 Before he was “The Church Guy,” Randy was Drum Major for the 1967-68 Flint Northern Viking Marching band. "You should have seen my white uniform after the Thanksgiving Day game!" he says. "Not a pretty sight." 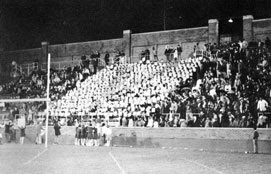 For more memories of Flint Northern in 1968, head to www.68vikings.com. Ah yes the mud bowl. My Mother (who went to Northern) would tell me stories about the Thanksgiving Day football game between Flint Central and Flint Northern. She said she and her sisters when every year, and by the time that they got home my Grandmother would be putting dinner on the table. I wish I could have seen Flint then. Randy, I recently discovered this site and low and behold there is my old slot car racing pal from Mallery Street. I thoroughly enjoyed reviewing your posts and seeing the pics of your family. I remember them well. I can almost smell your moms home made bread. I'll have to admit it was a bit disturbing to see Nancy and Jim as "grown-ups". To this day, I don't think I have heard anyone play "Surf City" on the clarinet quite like you. 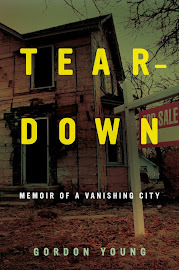 I've been living in Marquette MI since 1973 and am near the end of my career as a special ed. teacher. Take care buddy. John B. A special ed teacher. Good for you--and good for all those you have helped through the years. Congratulations! I recently came across a picture of that slot car set that we had set up to simulate a "real" accident. We were very creative! I also remember one night in your living room listening to the radio and hearing The Dave Clark 5's latest release. We called the radio station to get the name--"Bits and Pieces." I did like them better than the Beatles--must have been the sax player. Mom' still baking bread. She doing well and lives in Davison now. You're probably smelling the bread from there. John, I shall never forget those "way cool" experimental cars your dad used to bring home--especially the one that didn't have a steering wheel. A Buick, wasn't it? Had a knob that you turned? Am I dreaming this stuff? It's great to hear from you after all these years. God bless! Yes, those were special days. We'd bundle up, take a thermos of hot chocolate, and make the trek down to Atwood, watch the game, and then head back home for turkey and the Lions game. It would be about halftime before you'd start feeling you toes again. Man, that concrete was cold! But, worth it? You bet! Thanksgiving was always such a special day. My dad & his brothers graduated from Central, My mom and her family graduated from Northern. We went to every game from when I can remember. These mud bowls were pretty wild. I was fortunate to play in '73 and '74. There are DVDs available for many of the "Turkey Day" games. Here's a link to a page I put together for the '74 game. http://1974tdg.kwrhodes.com. The proceeds go to help renovate Atwood stadium. Which from the pictures you can find with Google, looks like it's coming along nice enough. 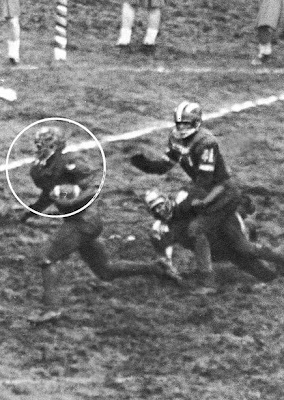 It was muddy in then '64 game. I lost my shoe in it and kept on marching. Got my picture in the paper. Northern won 15-0. The team wore shirts that said "Beat Central" and we did. There quarterback for Central I think broke his leg. My future husband was playing for Central and I still rib him about that game. It was a great tradition that should never have had to end.